The third in a series of dispatches from freelance writer Brandon Reynolds aboard the USCG icebreaker Polar Star. The ship entered the Antarctic Circle on January 3, on its annual resupply mission to the research base, McMurdo Station. It's a critical task imperiled by the nation's aging, shrinking fleet of ice-breaking ships. We sailed through the Southern Ocean as night ran out on us. Then it was endless day, and that's when we began seeing ice. 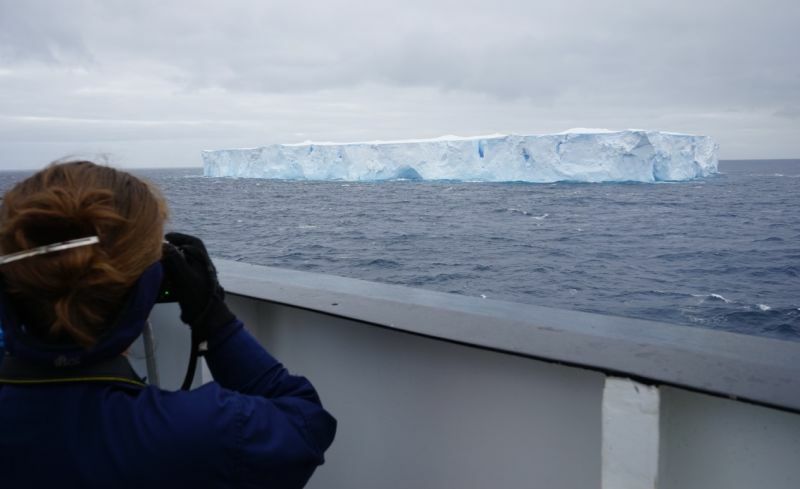 It started with a mountain that sailed by, one of the tabular icebergs that Operations Officer Lt. Joel Wright described in a briefing with officers who'd be driving the ship through the ice as "big-time Chiclets." Some of the bigger tabular icebergs are numbered and tracked across the ocean and are the size of cities. This one was about a quarter-mile long and stood 193 feet out of the water, according to somebody deft with a sextant. So, going by the rule of thumb, it extended nine times that distance beneath the surface. That's not even worth naming, size-wise, but it drew sailors to the bow to snap photos as the thing crept by. Most of what I know about ice came from that briefing from Wright. The big takeaway, at least as far as piloting the ship, is that though Polar Star is classed as an icebreaker, it's really an icedodger until it absolutely has to go through it. That's how you keep a 40-year-old ship viable. "What's the easiest way through ice?" Wright asked. "Around it," said somebody. Correct answer. After the meeting, spirits were high: some of these officers would be piloting through ice for the first time. Imagine the power to push a 399-foot ship through six feet of ice. Imagine having 75,000 horsepower vibrating under your hands. Even I was seduced, and I wasn't driving. American power! Then the lights went out. Everything was quiet, and then everything was loud. Sailors ran to emergency stations. "The last time this happened," Wright said before rushing out, "we blew our switchboard." He was smiling, but it was the smile of someone trying not to worry. Last year, right as Polar Star was about to pull in to Valparaiso, one of the main switchboards blew out. That switchboard controlled ventilation, lighting, and refrigeration to parts of the ship. For a few days after, electricity usage was restricted. 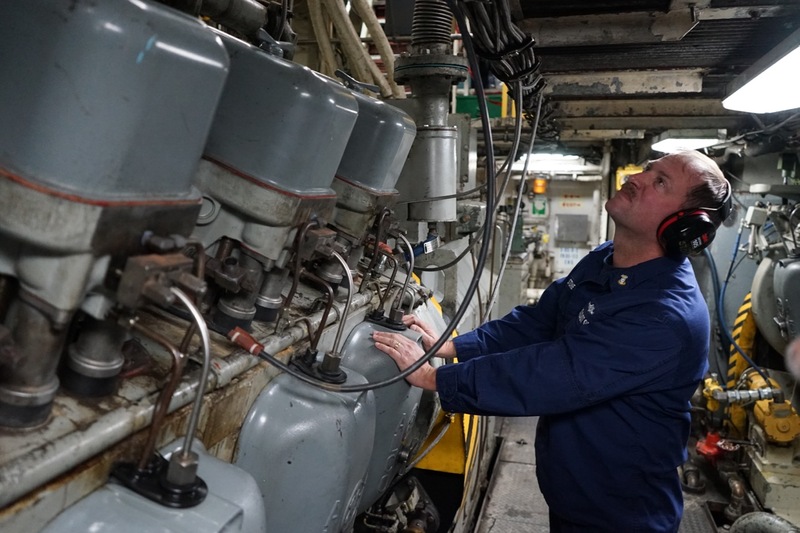 I asked Master Chief Tom Stone, a 30-year veteran of the Coast Guard and resident ship-whisperer, who was also onboard last year, how long it took them to decide what to do. "We pretty much knew immediately," he said. "Whenever you have a switchboard fire like that they're gonna send you home." After some rerouting, Polar Star limped straight back to Seattle, forgoing Valparaiso and other port calls. What everyone was worried about this time was another mission-ending crisis. Time was, there were many icebreakers in the American fleet. The Navy used to handle the icebreaker program, sending half a dozen ships to the poles and places like Greenland. 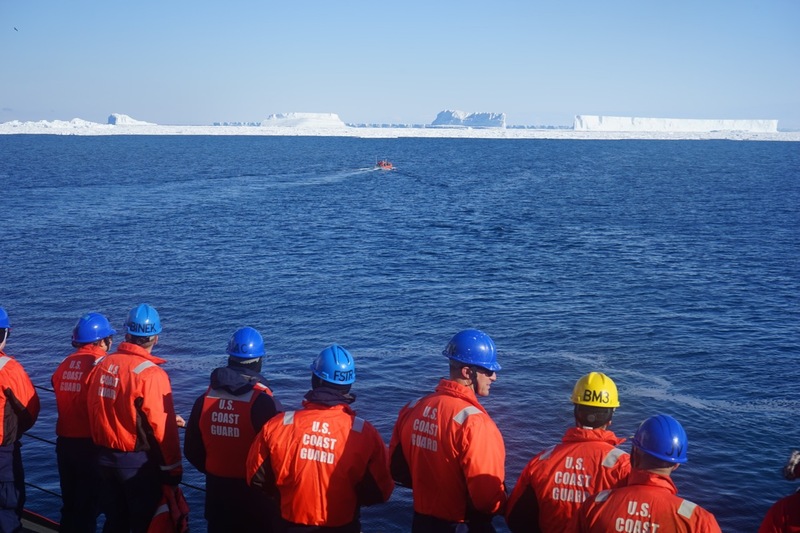 Operation Deep Freeze started in the 1950s to support the research at McMurdo, and that continued to be the mission when the Navy handed over the icebreaker program to the Coast Guard in 1965. Since then the supply of ships has dwindled as old ones have been retired and new ones have languished on the drawing board. Polar Star was commissioned in 1976, her sister ship Polar Sea in 1979. For a long time they'd cover the poles and other places. Then they were taking turns going south. They've had things blowing up and breaking down since they were commissioned. (Polar Star ran aground two days after it was launched.) It's in the nature of the ships, and the nature of the mission. Stay up after midnight and you'll hear the ghosts of alarms past yowling in the corridors. Generally they'd carry scientists, though the polar-class icebreakers have always been intended for operational support. This is Cold War thinking: make sure we have a little red tub of Ameri-can vigor ready to go to the farthest reaches. Still, science was such a standard that on the old-timey plaques above the doors here (there's one reading "Soda Fountain" over the door of what is now the "Polar Starbucks" (not affiliated with the Seattle-based coffee corporation) you'll see more than a few labeled "Scientist Stateroom." In 1999, the Healy was commissioned, a medium-duty icebreaker that goes north to the Arctic and carries scientists on a variety of missions. In the last decade things get hairy. The Polars continue to be costly to maintain. Engineering problems in 2006 forced Polar Star into what's called a "caretaker" status. After that, for funding reasons that have remained vague and that I hope this trip will shed some light on, both the Polar Sea and the Healy went north while the National Science Foundation, which funds part of the Deep Freeze missions, instead leased icebreakers from Sweden and Russia to sweep up the channel in front of the Antarctic station. In 2010 Polar Sea, after extensive renovations, broke. Polar Star had a $57 million rejuvenation and, now, this is the fourth trip since Polar Star was reactivated in 2012. In (American) summer 2013 she went to the Arctic to see how she fared; the winter of 2013-14 was the first time she'd gone south in nearly a decade. This, then, is her third trip to Antarctica since reactivation. For those who were around since she was fired up again, this is the first time since 2012 that things are (more or less) running smoothly. The mission, like the icebreaker fleet, has been scaled down. There are a few scientists running around onboard, but the one and only goal of Polar Star now is to break into McMurdo. After that she goes almost straightaway in for repairs, having no relief. Last year she was away from home 320 days, much of that in a Vallejo dry dock. As Congressional priorities shift and icebreaking looms less in the public consciousness than more local concerns, the icebreaker well has dried up. Now there's just Polar Star out here. (Healy made the trip south a few years back and didn't handle it well.) So if she breaks, there are no more. And if she breaks out here, no one's coming for us. 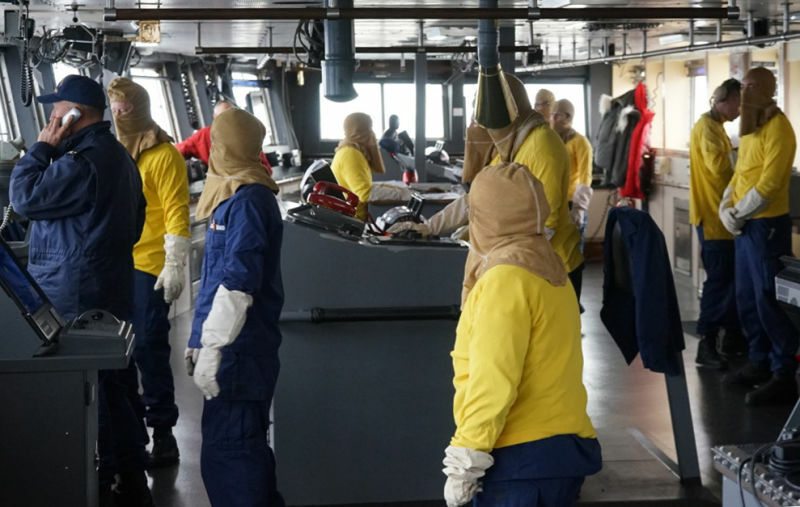 This gets into territory covered by what's called the wintering-over bill, a document that details spending a year on the ship, in the ice, in the event of a catastrophic casualty. It looms in the minds of these sailors somewhere between Lord of the Flies and a probably-very-compelling reality show. It'll loom a little more in their minds, and mine, as we get closer to Marble Point, 42 miles from McMurdo. We're going there to resupply a fuel depot after leaving McMurdo. The ice there is older and thicker. There may be a big-time Chiclet in the way. That's when the wintering-over bill may seem most relevant. This time, though, it wasn't a mission-ending casualty. Everyone tucked away their dreams of beards and penguin-hunting parties for another day. A diesel generator overheated and blew a transformer, shifting the load to another generator which was having absolutely none of it, so it too shut off. The emergency generator kicked in, there was some rerouting, and after a few hours, we were back up and running. I hear tell that there may be a new transformer waiting for us at McMurdo. This ship is powered by rumor as much as diesel, though, so we shall see. In any event, it has become clear to me that alarm bells and breakages are not only common but constant. In a ship with this many moving parts, under these conditions, at any given time, something, or someone, is quietly planning to go sideways. There are as many possible mishaps as there are kinds of ice in these variable seas.